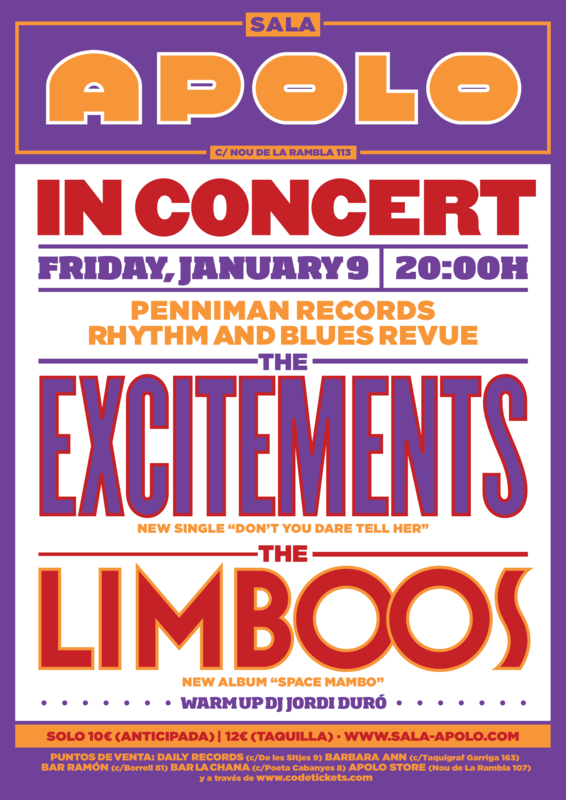 As you all might have discovered by now, we are kicking off 2015 with a bunch of new dates around SPAIN and FRANCE, and most important of all, BARCELONA’s APOLO is going to be set on fire with the first PENNIMAN R&B REVUE ever, which we’ll be part of with our label-mates THE LIMBOOS. This will be on friday, January 9th 2015. You can get advance tickets for that crazy night 10 EURO only here. 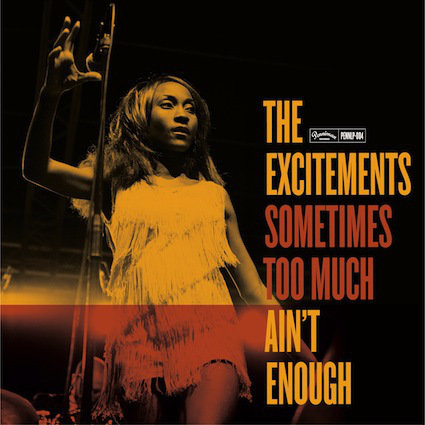 The wait is finally over, and we are delighted to announce that SOMETIMES TOO MUCH AIN’T ENOUGH, The Excitements’ second full-length is out on stores today! You will find it on your local record shop (support them! ), Penniman Records’ website, and as a download on several Internet stores such as amazon.com! Go get it while they last! The Excitements are a hardworking band, almost hyperactive, so when you are in a state of perpetual motion, things happen fast and time flies. Within six months of their first show in March 2010, the group was touring all over Europe, and recorded their first album. The album was a totally unexpected success which led the band across the continent for a year and a half. It’s sad to say, but “Sometimes Too Much Aint Enough”, the second LP, surpasses its predecessor in all respects, and gives the impression that until now the band was just warming up. The essence of their sound has not changed substantially over the debut, early Soul, R & B, and a hint of 50s gospel, but now fully developed, sharpened and fine tuned, thanks to two years of intense rehearsing and countless shows. It would be difficult to pick out a standout song from this album, because it contains twelve potential singles, so we won’t. Just listen to it, and see that everything is here- great originals and covers arranged and performed with a nod to all that you love, and a repertoire that offers everything from sophisticated R&B, soul, gospel, latin, Stax style instrumentals, and tear jerking, hypnotic ballads. Masterfully produced by Mike Mariconda, the band moves freely from a small combo to an orchestra with a sense of dynamics that few bands have today. The explosive voice of Koko Jean Davis demands that you jump, dance, and weep all at the same time, confirming that, indeed, there are times when too much simply aint enough. A few weeks ago we unleashed a taste of our upcoming LP “Sometimes too much ain’t enough”, the single known as “Ha, ha, ha”, and now, we present you it’s video! Also, after a great demand from our fans, we will be releasing “Ha, Ha, Ha” on a 45 with an exclusive B side not included on the LP (as usual! ), so keep watching our website, facebook and Penniman Records website and grab a copy when it comes out, this time, with a little limited surprise for ya’ all, keep it up and get down! As some of you may know through our previous post on our FACEBOOK page, we’ve had last minute problems and we deeply regret to announce that we have been forced to cancel the first week of our Spring dates through Europe. As it is, the following dates have been cancelled, and we promise to return as soon as possible during this year, which will also see the publication of our just recorded second album. Again, we are really sorry to be forced to cancel this dates, and hope we’re never in this position again, because our public always comes first and deserves the best, we will visit those places for sure in the near future! Check our tour dates section for all our shows for this next spring, including GERMANY, FRANCE, SWITZERLAND, BELGIUM, NETHERLANDS and UK. The Excitements played early this year at the world-famous Eurosonic Festival in the Netherlands, and the WDR legendary TV program Rockpalast was there to film it, you can check out the show here! After two years of heavy touring around the globe, The Excitements are taking a bit of a break during these days while they prepare a brand new album to be recorded during the spring time, and to be hopefuly released after the summer. Some of the original songs by the band have been heard live in the past months, such as the crowd pleasing ballad “I’ve bet and I’ve lost again”, and will be joined by a handful of covers in a package that will rock your soul! To all our fans, we salute you! Finally we’ve uploaded our website: here you’ll find all the news related to the band, our official schedule of concerts, our shop (still working on that) with records, merchandising and any other goodie we can offer you, and even contests and exclusive material from the band and our label Penniman Records. So stay tuned and welcome to our exciting new page! The band is just ready to hit the stage at the Eurosonic Festival held in Groningen, Netherlands. We will play two shows, wednesday 9th and thursday 10th of january, and the second show will be televised on the legendary Rockpalast show on WDR channel. New Promo photos just uploaded! You can find the results of our brand new photo shoot for 2013 on our image gallery now!